Who me? 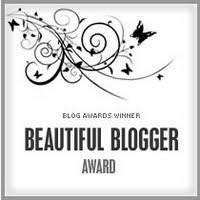 Beautiful Blogger Award?! 1. I’m an only child and have a love-hate relationship with it. 2. I underwent hypnotherapy because I used to be so afraid of birds-slash-anything-with-wings-slash-feathers. I would have anxiety attacks and wouldn’t even walk around the lake in fear of coming across a duck. No joke. But it worked. I’m no longer scared, but I wouldn’t want one as a pet. 3. I’ve been a dancer since I was three, until I was injured at a dance competition when I was sixteen. I miss it so much. 4. I’m actually pretty shy and I hate that about myself. 6. I’ve had the same best friend since I was in kindergarten. 7. Is it weird that I can’t think of another “interesting” things? When I asked B, “What’s interesting about me?” He thought it was a strange question and said, “That’s a tough question. Umm…. you can read fast.” Me: “Really, that’s all you’ve got?” Okay, well, I guess I can read fast. I actually really love to read and I try to read something before I go to bed every night. It eases and clears my mind. One of my goals in life is to write a book. Whether it’s a “chick-lit” or a children’s book, I hope to accomplish this one day. I hope that was interesting enough for ‘ya! Watching the Grammys right now… cheering for my girl, T-Swift. I can’t wait to see her performance with a “surprise.” I hope everyone had a fabulous weekend. Even though I worked today (yes, Sunday) I had a wonderful time at B’s White Coat Ceremony. Post and pics coming soon. I'm an only child too…I love it, ha! That's crazy about the bird fear…I can't stand bananas, ha! I know it's weird, and I have NO idea why but they just GROSS me out ..ewwww! But, I will eat them if they are pre-cut and I don't see the peeling/de-stringing process, ha! That is too cute, Blake! Hope you enjoy watching the Grammy's and hope you had a great weekend! I HATE birds too. They totally freak me out. Taylor was so great at the Grammys!